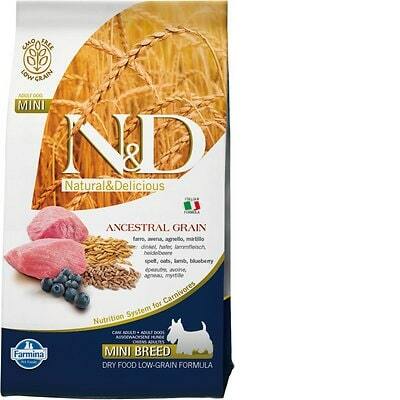 Farmina Natural & Delicious Mini Breed Formula is a high-priced dry dog food with exceptional quality. This product actually manages to ace all of our review categories, which is very hard to do. Here is what makes this product stand out: It has no controversial ingredients, including zero artificial preservatives, flavors or colors. The food also has very well-balanced amounts of protein, fat and carbs and excellent meat and fat quality. Additionally, Farmina has zero recalls and was also extremely open, helpful and transparent when answering our questions. Watchdog Labs highly recommends this product. Lamb Meat, Dehydrated Lamb Meat (Source of Glucosamine & Chondroitin Sulfate), Whole Spelt, Whole Oats, Dehydrated Egg Product, Herring (Source of Glucosamine & Chondroitin Sulfate), Dehydrated Herring (Source of Glucosamine & Chondroitin Sulfate), Chicken Fat (Preserved with Mixed Tocopherols), Herring & Salmon Oil Blend (Preserved with Mixed Tocopherols), Dried Beet Pulp, Dried Carrots, Sun-Cured Alfalfa Meal, Chicory Root Extract, Fructooligosaccharide, Yeast Extract (Source of Mannan-Oligosaccharides), Dehydrated Blueberry, Dehydrated Apple, Dehydrated Pomegranate, Dehydrated Sweet Orange, Dehydrated Spinach, Psyllium Seed Husk, Dehydrated Blackcurrant Berry, Salt, Brewers Dried Yeast, Turmeric, Vitamin A Supplement, Vitamin D3 Supplement, Vitamin E Supplement, Ascorbic Acid, Niacin, Calcium Pantothenate, Riboflavin, Pyridoxine Hydrochloride, Thiamine Mononitrate, Biotin, Folic Acid, Vitamin B12 Supplement, Choline Chloride, Beta-Carotene, Zinc Proteinate, Manganese Proteinate, Iron Proteinate, Copper Proteinate, Selenium Yeast, Dl-Methionine, Taurine, L-Carnitine, Aloe Vera Gel Concentrate, Green Tea Extract, Rosemary Extract. Lamb is generally a healthy dog food ingredient that adds protein, fat and other healthy nutrients to the dog food. Raw meat contains about 75% water which is cooked off during the making of dog food. This leaves only a fraction of the protein content in the final product weight. We recommend looking for dog foods that also include meat meals in the first five ingredients (pre-cooked meat powder that contains four times the amount of protein). Lamb is generally a healthy dog food ingredient. Glucosamine is a combination of glutamine (an amino acid) and glucose (a sugar) that's present in chicken. Chondroitin sulfate is a chemical that's naturally found in the cartilage around the joints of animals. Dehydrated beef have had their moisture removed with hot and dry air to preserve them. Spelt (also known as Dinkel or hulled wheat) is a species of wheat. It's rich in nutrients, including protein, dietary fiber, several B vitamins and dietary minerals. We generally consider it a healthy dog food ingredient. Oats are a cereal grain and a source of carbs, protein, dietary fiber, several B vitamins and dietary minerals like manganese. They are a high-quality dog food ingredient that can potentially help with colon health. Dehydrated Egg Product are shell-free eggs that have had their moisture removed hot and dry air. While it provides nutrients like protein, it can be made from food-industry waste products such as eggs that failed to hatch. In other words, quality can vary. Because there are better protein sources (like whole eggs or meat) we do not consider this a high-quality dog food ingredient. Farmina has not included any controversial ingredients in this food. ‍Farmina is manufactured in Italy. ‍Farmina clearly names the meat and protein sources like lamb meat, dehydrated lamb meat, dehydrated egg product, herring, and dehydrated herring. This is great because it shows you the species the ingredient comes from. They are just as clear with the two fat sources chicken fat and herring & salmon oil blend - all of them identify the source they come from. ‍This Farmina product does not contain any controversial preservatives. It’s good to know that ‍not all artificial preservatives are bad. That’s because they serve an important purpose, which is to prevent food from spoiling. However, we consider 11 artificial preservatives controversial because of their potential link to cancer and other serious health conditions. ‍No artificial colors are in this product. ‍No artificial flavors are in this product. Our research shows no dog food recalls for Farmina in recent years. That’s great to see. ‍Farmina was one of the few companies that responded relatively quick and with complete answers. Our first email was responded to on the fourth day after being sent. We have 2 nutritionists - Francesco Massimo Castaldto and Luigi Monda. We also strictly cooperate with Animal Nutrition Department of University of Naples and the head of its team - Prof Monica Isabella Cutrignelli. All our products are formulated according to both AAFCO and FEDIAF guidelines including trials. We do not do the feeding trials, but we perform palatability and stool testing. This is to be understood as they do formulations, not feeding trials. Production facilities are located in Italy (dry food), Serbia (dry + wet food) and Brazil (dry food). Visiting them is possible only for our distributors. Each facility is equipped with a modern laboratory where all produced batches are being checked both from analytical and microbiological point of view. All factories follow HACCAP system and ISO certification. This is to be understood as they do own their facilities. Often companies as large as Farmina, depend on suppliers that may source raw materials from China.